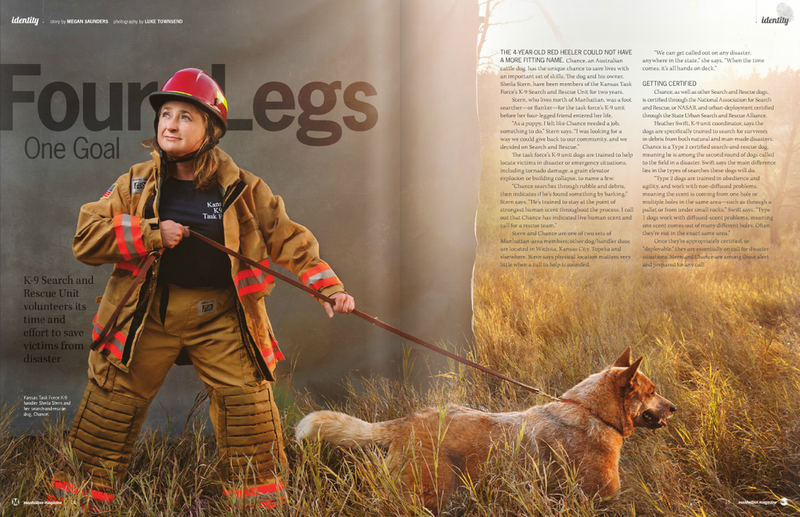 I was recently assigned to make a feature image of Kansas Task Force K-9 Unit volunteer Sheila Stern and her dog Chance that ran in the latest issue of Manhattan Magazine. For me, visually, I wanted to produce an image that brought the viewer outside, into the field as if they were on a search callout. The story isn't about the location I put Sheila and Chance in so I also wanted to introduce elements of a studio that allowed me to separate the subjects against a background while retaining the experience of being on location. I knew this image would end up running double truck in the magazine so I used the placement of the background to allow for subject separation while giving ample room for text over the blown out sun on the second page. We had about 15 minutes to make this picture before the sun set and I lost all of the light on the grass. I wanted some level of gesture to give the image movement. Sheila would toss a toy right near a light I had set up, gelled warm to light Chance's face, and Chance would pull on the leash to go that direction. Quite a few tries later and we get the frame that ended up in print. The Kansas Search and Rescue Dog Association is the largest volunteer Search and Rescue group in Kansas with over 140 callouts in over 40 counties as well as providing assistance to neighboring states, Oklahoma, iowa, Missouri, and Nebraska. The KSARDA team has assisted in saving 21 lives, including 10 children and respond to drownings, nursing home walk-aways, missing children cases, HRD searches, and disasters. It's pretty cool to be able to illustrate photographically the importance and dedication to saving lives that embodies these volunteers and I'm glad to be able to make that picture for Manhattan Magazine.